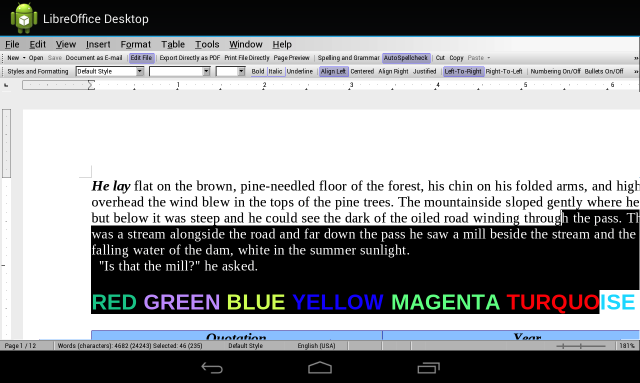 A pre-alpha version of LibreOffice for Android, running on a Nexus 7. LibreOffice developers have been working on bringing the open source office suite to Android for more than a year. But aside from a remote control app that lets you use your phone to control presentations running on a desktop, nothing has yet hit the Android app store. That could change quickly—if only there were more developers working on the project. LibreOffice developer Michael Meeks of Attachmate's SUSE business unit says much of the work on an Android port is done. But with SUSE focusing on the desktop version of LibreOffice and its business customers, the company can't invest much in the way of time or resources in the mobile project. That leaves Meeks and developer Tor Lillqvist pecking away at the Android port in their limited free time, perhaps a few hours a week. "There are lots of calls on our time. Sadly, that's not something SUSE can invest a lot of effort in at the moment," Meeks told Ars yesterday. "On the other hand, in the past lots of effort has been invested. So what's there is pretty encouraging."